crafts, books, fish sandwiches, motorcycles! and other shiny things. So THAT’S what a titled frame is worth? I just didn’t know they were worth so much. And really, what MIGHT be a back wheel? Seriously – is this photo taken over the neighbors fence? 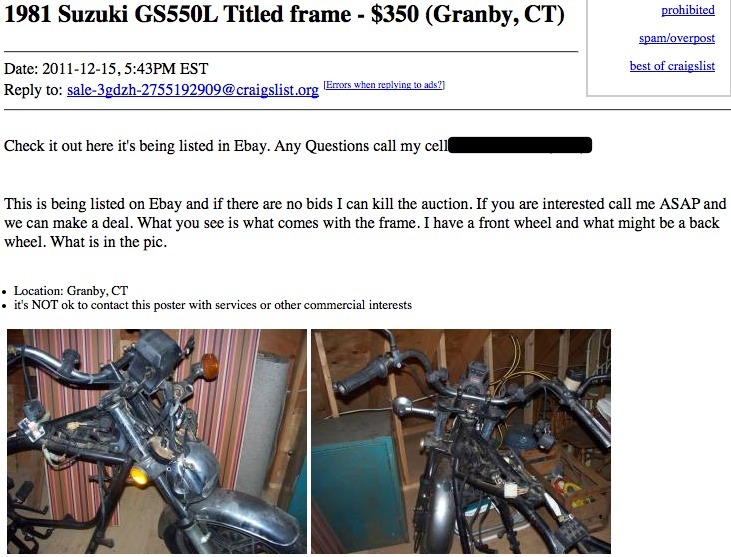 Because this ad does not fill me with confidence that it’s being sold by the legal owner. I’m starting a new thing. 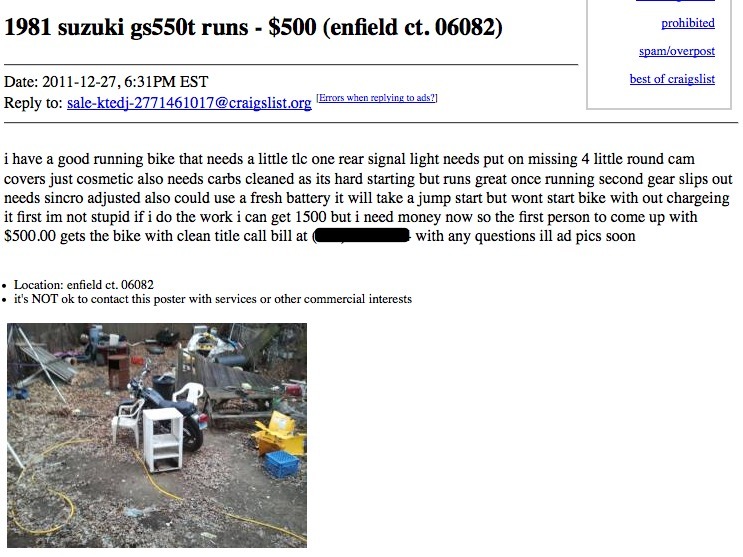 I keep doing searches on craigslist for old motorcycles to rebuild, and seriously, some of these are super priceless. I am very tall. I have bright red hair. I have a black belt in tae kwon do. I knit. I try to spin my own yarn. I read voraciously and indiscriminately. I have a sewing machine, and I constantly plot the making of my own clothes. I like foods that go with red wine. The red wine is coincidental: I also like gin, the drink of washed up movie stars, and margaritas, the drink of pretending either that it is summer, or that what you do tonight won't matter in the morning. I am a motorcycle enthusiast, and I am plotting a carb breakdown to get my bike back on the road. I am a nerdy kind of girl but one with a goal to throw dinner parties wearing aprons and to keep jars of fresh flowers around my home.